Lighthouse Resort Condos: Gorgeous Gulf Shores Vacation Rentals! Relax while experiencing breath-taking vistas from deluxe suites in the beautiful new luxury condominium resort, The Lighthouse Resort in Gulf Shores. Enjoy the resort’s 635-foot private beach, hot tubs, and Gulf-view fitness room with sauna or cool off in the two private Gulf-front pools. One, a zero-entry pool with four waterspouts, is perfect for children who can walk into the gently-sloping pool at ground level. Guests may swim year-round in the heated indoor pool. These Gulf Shores vacation rentals make for the perfect family beach vacation. Located just one mile east of Highway 59, The Lighthouse Resort condos in Gulf Shores are the perfect setting for a family vacation, with one, two and three bedroom suites available. Decorated to a high standard, these Gulf Shores condos feature fully-equipped kitchens, washers and dryers, cable/satellite TV, DVD and CD players, and high speed Internet. Master bedrooms feature both a shower and a large whirlpool tub. The dressing area has his and her vanities with a large walk-in closet. One bedroom units offer two full baths while larger condo units include a bath for each bedroom. > Learn more about The Lighthouse Resort's amenities. The numerous nearby restaurants in Gulf Shores range from family-friendly, casual seafood spots to fine dining establishments. Sports enthusiasts can choose from golf, tennis, kayaking, sailing, windsurfing, fishing, snorkeling, diving and other water sports that abound locally. Serious shoppers have ample choices at the area outlet malls, art galleries, and boutiques. Spend an afternoon at one of the local amusement parks or, after a day in the sun, take in a movie at a local cinema. > Learn more about planning a Gulf Shores vacation. Check the rental rates at The Lighthouse online here. Our Gulf Shores vacation rentals are sure to please! Call now to book your next fabulous Gulf Shores beach vacation at 800-890-1265 or click here to contact us online. 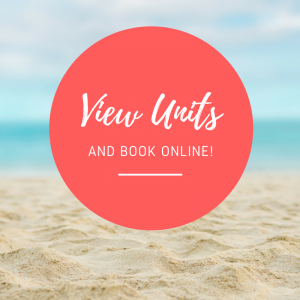 Check the rates on our Gulf Shores Beach rentals here.